Sun Vitamin D: What Does D do For You ? Yes, it Boosts Glutathione. Sun vitamin D is the one vitamin we should be taking every day. Unfortunately, as as society, we prefer the instant gratification of a pill rather than the pain of taking time. This is an example of humans loving extremes. Did you know it is free. Did you know it helps you make GSH? Do you want to get even more benefit from vitamin D? Then get at least 20 minutes of sun exposure on your skin daily. If you are working in the sun, boosting your GSH and maintaining hydration and taking unprocessed salt on your tongue (The Water Cures Protocol) will help you get the most from the sun without the harmful effects. Face it, we live in a world of extremes. Use and abuse of the effects of the sun are an example of those extremes. Some are working on their tans to be dark. At the same time, they are conducting a personal clinical trial on premature aging of the skin and cancer growth. Others in the effort to protect themselves or just because they are too busy, get almost no or totally no sun at all. There is a third group trying to get lighter. They spend thousands on Glutathione even though science says it cannot be absorbed and there are no studies that say it lightens your skin? Nope. Not one. Nada. Zip. Zero. If you have a relative in a nursing home, when was the last time they got outside to get some sun (unless they were one of my patients)? Vitamin D, called the ...sunshine vitamin... although in some foods, is mainly made by the action of direct sunlight on our skin. Vitamin D is actually a hormone. Why Do We Need Sun Vitamin D? Now vitamin D is found to control a gene carried by people with multiple sclerosis. Pregnant women with good levels are less likely to need a cesarean. If you have high levels of vitamin D you are likely to have better brain function. You will have lower risk of certain cancers. Lower risk of heart disease compared to those with lower levels. Sun screen blocks the vitamin D production so if you are very sensitive to the sun this may not be for you. Sun bathing is not necessary however. Another of the extremes of he world we live in, sun and the ever elusive tan, has resulted in melanoma rates, the most dangerous type of skin cancer, almost quadrupling since the 70s. 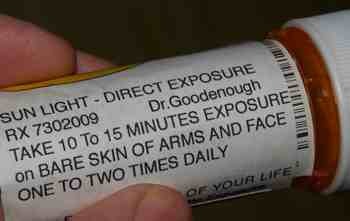 Along with vitamins K, A, and E, the vitamin D supplement is toxic if overdosed. You cannot overdose on vitamin D from the sun. Our body only makes what we need. Sorry, but you cannot store it up for future use. What about winter and the lack of sun in our lives. Oily fish like salmon and sardines have it. Milk and eggs have it too. If you need to or want to take supplements, you should talk with a health care professional. Usually only women who are pregnant or breastfeeding, those over 60, and possibly vegans and vegetarians will need to supplement. If you supplement, you will most likely need vitamin K2 to get the most out of it. Since it has a long half life in our body, many doctors suggest it is not needed daily, rather every other day for those with low vitamin D and 2x a week for those otherwise health. If you have to totally cover up outdoors, for religious or health reasons, this would be another reason to supplement. In all cases you should consult a qualified health care practitioner. Vitamin D and sun exposure work together to do more than just help you absorb calcium. It helps your body produce glutathione. New clues about vitamin D Functions, a paper from 2002 looked at some of the neuro-protective effects and benefits of the sun and vitamin D.